As of about 2005, 2006, we were in a position like, the Church did not have in-house print facilities. So, Chairman of the Board, Mr. Miscavige, was working on the project that LRH directed of—bring the materials back to their original source, bring them back as LRH spoke them, as LRH wrote them. These are the books and these are the lectures. And he was on that project, he was completing that project. And near the completion of that project, he turned to a group of us and said, “We’ve got to set up the publishing lines so that we can bring these materials to everyone. 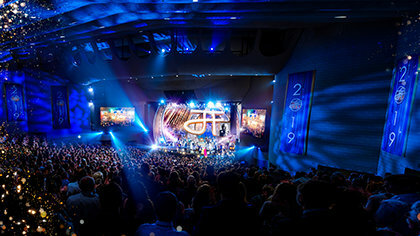 It’s not enough just to have them, we have to be able to produce them.” So, what you see at Bridge today, what we have at Bridge today, is the realization of LRH’s dream at being able to make, you know, his technologies of Dianetics and Scientology available to everyone, coupled with Mr. Miscavige’s vision of how to do that today, how to do that in our world today. Everything we have here in terms of the set-up is totally state-of-the-art. The passion that we have, the excitement that we have for what we do is something that, you know, is instilled and inspired by Mr. Miscavige. The things that, you know, when we set up a new facility like this one, what we set up for the—all of it always includes the setup for the, the staff. How do we make sure the staff have what they need, how do we make sure they have what they need to do their job, that they’re doing it comfortably and as well as they can do it. And, you know… things are, they’re exciting, we’re expanding, there’s a lot of work to do. People are up for that. And, you know, that excitement—that excitement is what inspires everybody to do the job that they’re doing here. I have been privileged to work directly with him for about, for almost ten years on the various dissemination projects that the Church has been involved in. Working with him is fast. It’s exciting. It’s challenging and exhilarating. Like, the things that we do are things that we never thought we would do, that, you know, that I never thought I would be involved in. So, he’s an amazing mentor. He’s an amazing leader. He’s an amazing friend. He’s—I couldn’t ask for a better friend personally. I couldn’t ask for a better teacher. I couldn’t ask for a better boss. I couldn’t, I couldn’t ask for anything better. He has seen so much more in me than I have ever given credit to myself of what I thought I would accomplish. Like, words can’t express how much I appreciate that. Like, that’s the highest compliment you could possibly be paid. What’s it like working with him? His sense of humor is incomparable. He’s exceptionally and maybe abnormally normal. He likes a great taco truck. We’ll sit down and have a grilled cheese sandwich together. Like… it’s as normal as you can, as you can conceive of, with an exceptionally amazing individual. 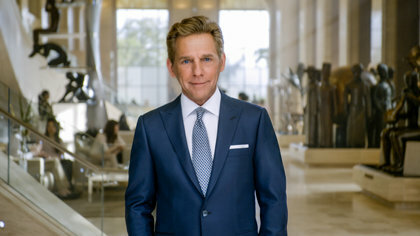 Mr. Miscavige sees you and he knows you, who you are personally and he knows what you can do. And that’s how he operates with, with anyone he works with. That’s how he operates with me. He has always seen more in me than I have seen in myself. And he has always insisted of me that I am as great and as successful as I can be. And that has run the gamut from apprenticeship and training and mentoring on, you know, particular projects. But it’s run the gamut to personally seeing to my health when it needed to be personally seen to. It has seen to asking about my family and how my, how my mother is doing. It has seen to sending, you know, pies when my hometown football team wins the championship. It has seen to so many different things that, you know—he’s my, you know, my superior, he’s our chairman, he’s our leader, but he’s also the greatest friend that you could ever hope to have. He has your back, and you know he has your back. And everything that you’re going to try and accomplish and succeed at, you’re—if you’re doing it with him, you’re going to succeed.